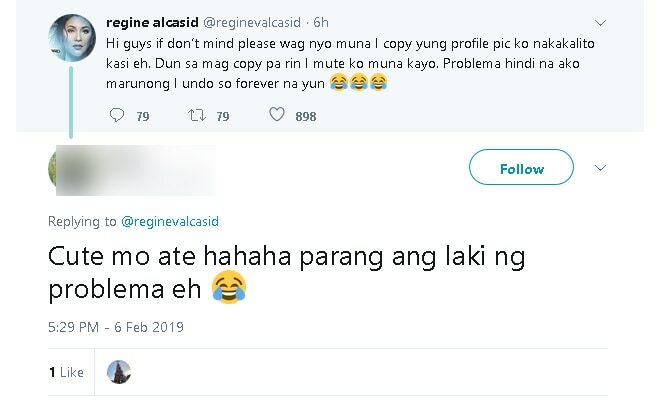 Regine Velasquez on Wednesday asked her followers on Twitter to stop copying her profile picture as it leads to her confusion. Singer Regine Velasquez on Wednesday asked her followers on Twitter to stop copying her profile picture as it leads to her confusion. Although her account has a total following of 2.6 million, the Asia’s Songbird has yet to receive her verification from the said social media app as of writing – probably why she had to appeal to her fans to instead take initiative. While she sure meant every word, fans couldn’t help but find the tweet rather amusing. Currently, Regine is gearing up for her Valentine’s Day concert with Vice Ganda to take place this February 15 to 16 at the Araneta Coliseum.